Most side effects from vaccination are mild, such as soreness, swelling, or redness at the injection site. Some vaccines are associated with fever, rash, and achiness. Serious side effects are rare, <define rare> but may include seizure or life-threatening allergic reaction. Under the National Childhood Vaccine Injury Act of 1986, nearly $3 billion has been awarded to children and adults for whom the risks of vaccine injury were 100%. 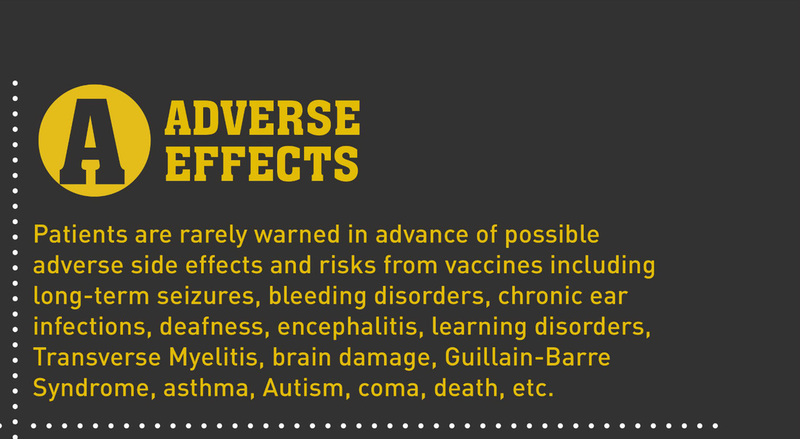 Vaccines are pharmaceutical products that carry risks, which can be greater for some than others. NVIC encourages you to become fully informed about the risks and complications of diseases and vaccines and speak with one or more trusted health care professionals before making a vaccination decision.